The last entry into the illimitable “Rocky” franchise was less a genuine movie than a shameless trip down memory lane, a pandering attempt to re-create the original in order to engender an apology for the grotesque fifth installment. This speaks directly to the franchise’s fraught nature with its own history, each of the film’s five sequels becoming more and more weighed down by the original. Rocky’s life and world was ostensibly always changing, but the ensuing films rarely felt any different, never engaging with the series’ context in any meaningful way other than as a means to get their protagonist back into the ring for a concluding rumble. 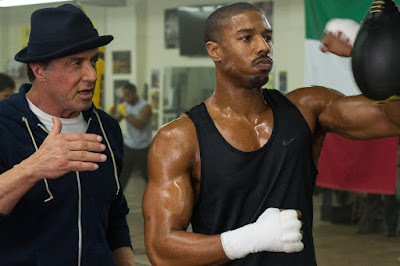 Ryan Coogler’s “Creed”, however, while created very much in the image of the first “Rocky”, finally employs the series’ copious amount of history as a genuine ally rather than a narrative crutch in forcing the titular character (Michael B. Jordan), son of the series’ great Apollo, to, above all else, grapple with his heritage, forging his own identity even as he reluctantly embraces his roots. It’s notable that this is both the first story of the “Rocky” series not bear its primary character’s namesake and not to have been written by the man who made that character iconic – Sylvester Stallone. (It was written by Coogler and Aaron Covington.) He’s still here, of course, in that familiar pork-pie hat with the iconic stumbling voice, but Stallone is more than willing to simply offer support, ceding the spotlight to Jordan. And Jordan is remarkable. Playing the conspicuously named Adonis Johnson, tellingly rescued in a pre-credits sequence from a juvenile home by Apollo’s widow, Mary Anne (an exemplary Phylicia Rashad), he nimbly walks the wire between blistering Apollo-ish arrogance and the forceful stoicism of the woman who raised him. Though this marks him as his own person, his legacy still hangs over to him so forcefully that he rejects the privilege his name has afforded and left la-la-land for Philadelphia. Legacy is not only Adonis’s burden, of course; it is also Rocky’s. The real-life Rocky statue is seen in the film as being a product of the on-screen character’s legacy, as close as this otherwise earnest film gets to meta commentary. And the history Rocky has with Adonis’s dad is the precise reason he decides to train him. So many of these Philly-set sequences fall right in line with the series’ tried and true formula – Adonis receiving an improbable title shot against an unbelievable opponent through a series of fortuitous circumstances, welcoming the challenge, stumbling, and then rising to it. But Coogler relays this formula with freshness. Rocky gets his young protégé out of Mighty Mick’s Gym for a new place, evoking the change in Philadelphia, shifting from Italian-American to African-American, but how in so many ways that underdog spirit has remained intact. More than just injecting the formula with acute flavor, however, “Creed” gets the smallest details just right, investing heavily in its characters. Look no further than Adonis’s obligatory love interest, Bianca (Tessa Thompson, effortlessly charismatic to the nines), a local musician. Where the immortal Adrian was shy, Bianca is self-possessed, a perfect match for someone as confident, if kind-hearted, as her pugilist paramour. Their few dialogue scenes crackle with so much wit and joy you wish there were more of them. She doesn’t just react to Adonis, she challenges him. In maybe the movie’s most indelible scene, Adonis points out her dual hearing aids, allowing her to explain that she is on her way to becoming deaf, and already getting ready for it, doing what she loves for as long as she can. It’s a beautiful moment that works all on its own, delivered by Thompson not with pity or schmaltz, but someone who has already made a hard-won peace with it. Yet even more than the moment it comes to emblemize the plight of a boxer too; a life, as Adonis is constantly warned, that can take so much away even as it’s giving so much. Rocky himself is allowed to function as living proof of this. He may have a statue, but he’s also hauling carts of produce for his little trattoria out of the back of a van, talking and moving slower, wheezing, coughing, finally, truly acting his age. Even if you wish the movie pushed at his idea harder, it’s still commendable. The boxing scenes themselves also make clear the toil that time in the ring can take while simultaneously illustrating their admitted pull. The first fight is a technical marvel, rendered in a breathless single take, filmed exclusively inside the ring, moving and prowling with the fighters, the refusal to cut evoking the inability to escape once that bell tolls, the unrelenting barrage brought home with acute sense of realism that truly lets you feel what it means to box. 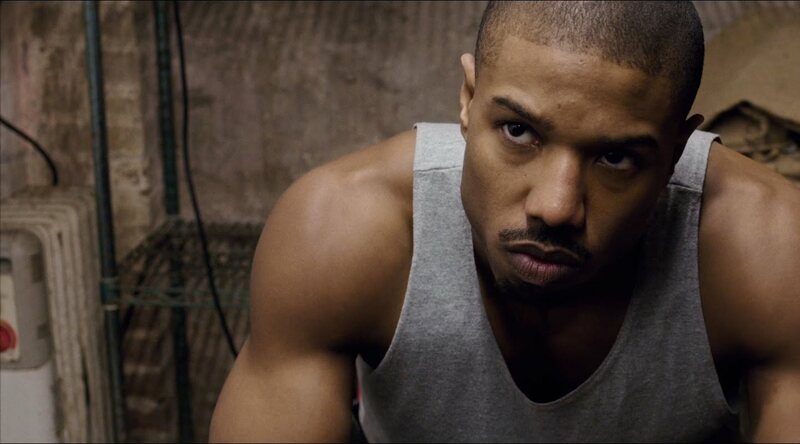 Even so, it does not skimp on the endorphin rush Adonis feels, the reason why someone would give so much in the moment to lose so much more in the end; it’s a primal if complicated power that Coogler and his cinematographer Maryse Alberti implicitly capture. The climactic bout, frankly, is a little less invigorating than this first one, a bit more akin to its predecessors, what with the music explicitly quoting Bill Conti at a pivotal moment which shamelessly but very, very successfully rouses all holy hell. Still, you’ve become so invested in this person and these people by this point, that you turn a blind eye to those strings being pulled – at least, I did, and so what? And anyway, Coogler is intelligent enough to know the fight is not what makes or breaks Adonis. Look no further than his patriotic boxing trunks, emblazoned with both “Creed” and “Johnson”; he enters the ring having already re-claimed his heritage even in carving out a name for himself. It’s the same feat achieved by Coogler. This film fits snugly into the series, but Coogler makes “Creed” his own.